August’s work stream will be happening on Friday, August 19, at 3PM PDT, in our Twitch channel, as usual. Mane6’s July Work Stream is scheduled for next friday, July 22, at 3PM PDT, in our Twitch channel. Our background artist, Lindsay, will be joining us this week to show some stage background process & progress. We’d like to let you know that the next Monthly Work Stream is scheduled for next Friday, May 20, at 3PM Pacific, at our regular channel on twitch.tv/manesix. Recordings, as usual, will be on our youtube channel the Monday after. It’s that time again! time for the monthly work stream. For this month, we’ll be streaming on Friday, April 22, at 3PM pacific (our usual time) at twitch.tv/manesix (our usual channel). Mane6 Work stream #3 – Archive. Stream over!, Thanks to everyone for joining us. You can now watch the recording in youtube. https://www.mane6.com/wp-content/uploads/2016/02/WorkStream3head.png 321 845 Mane6 DevTeam https://www.mane6.com/wp-content/uploads/2016/01/M6V3-BlackMid_Transparent.png Mane6 DevTeam2016-02-19 17:03:502019-02-12 22:43:07Mane6 Work stream #3 - Archive. Join us at our twitch channel this Friday, February 19, at 3PM Pacific Time (6 Eastern) for our third work stream. Be sure to bring your picnic baskets! We’re streaming some work progress. come join us! Stream over, thank you for coming; You can see the recording on the following videos. Wow, it’s been a month since the crowdfund ended already? Alright, fess up, who broke time? It was yesterday just yesterday! This will be a very casual work stream, in which Jay (and maybe Omari) will be working on game stuff of the modeling and/or scripting kind; It’s meant more for hanging out with you guys and showing some of our progress as it happens than to show new and finished stuff. We’ll still have streams for major milestones and showcases of new characters, of course!… but let’s take it one stream at a time. So mark your calendars, get your alarms goin’, and get ready to picnic with us in the stream. And if you’re interested in more detailed reports of what has been going on, keep reading! Things are still moving; And as we learned from the time used on establishing the company before the crowdfund, when it comes to the legal flavour of things, there’s a lot of back and forth required. Currently, we’re setting up the sort of things that we could not get set up until we had a solid, set-in-stone budget to work with, such as contractor agreements, NDAs, licensing deals, how we’re going to be paying people and for the game expenses (it’s not as easy as just sending the money, tax records wise)… All that sort of stuff. While the main team has kept on working on the game proper, and full time since the funds arrived to the company’s paypal accounts, these things have been happening on the side to help set up the foundation for the development cycle. Right now, our priority lies on getting the team settled in with the company (speaking in terms of legalese stuff), after which we’ll be looking into the direction of licensing (Fmod, GGPO, etc) and contractors (A Sound Designer, mainly), and on to the other expenses we need to cover in the immediate future. Forums come in this zone, as well. We’re sorry it’s been taking this long to get things set up, but right now it’s very important for the game progress that the agreements and contractings get handled as a priority. We’re still working to get this done as fast as possible. Stream Saturday 21, 3pm PDT, on the M6 Twitch channel. Mane6 working full time in game. Things need to be set up so we can start paying people/buying things. Have we mentioned that you guys are awesome? Because seriously, you ARE awesome. One month, 10,529 backers and a bit over $587,000 later, we emerge from this crowdfund at 135% of our original goal of $426,000 to fund the development of Them’s Fightin’ Herds. 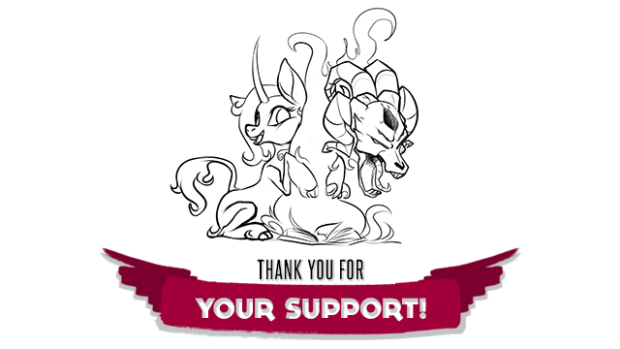 This means we reached our original goal for the initial release of the game with 6 fully playable characters, an additional character (Goat), her story mode, Dynamic Music System additions, lobby sprite, lobby stage AND in-fight stage. We also ended with a small additional buffer on top of our last stretch goal ($560,000), which will allow us to spend some more time adding polish here and there to the game. Don’t worry guys, we’ll put that money to good use. With that said, we have a few topics we’d like to cover with you guys! At the start of our list is taking care of the first chunk of the reward bundles. While most of the rewards for the crowdfund will be delivered late in development, there’s at least one of them that will be handled in the coming weeks: Access to the Backers Forums. We’ll be giving access to everyone with the Backers Forums perk in the coming days. We need the crowdfund money to come through and into our account so we can begin purchasing the necessary software to get the forums up and running. This will happen in the next 15 business days. We’ll let you know through the Indiegogo updates page once that has been solved and as we start setting up the forums for you guys! As a reminder, our way of contacting you for pledge rewards will be through the email you set on your Indiegogo account. Make sure it is correct so we can reach you properly! We’d also like to reaffirm that stuff marked in the crowdfund as “Backer’s Exclusive” (The backer’s palette, the “Backers Edition” of the physical game/soundtrack, the in-game flair and at least part of the items in the Lobby Accessory Pack) will remain Backer’s Only. Same with the Golden Super Toot, Silver Super Toot, Tiny Toot and the Party Hat, which will only ever be rewarded from our crowdfund’s referral contest. None of these items will be reissued or reprinted at a later date as post-release DLC or for “GOATY” (Game Of All The Years) versions. Exclusive means exclusive. We’ll be announcing the grand prize winners to the referral contest soon. But you can check if you qualify for the Tiny Toot or the Party Hat yourself by going to your profile page on Indiegogo and selecting the “Referrals” tab there. Note that your account must have pledged in a tier $12 or higher (i.e. must actually own the game) for you to be able to receive the rewards. Lots of people were asking about this one! We’d like to continue having streams as development goes so we can show our progress and maybe work a bit on the game on the stream live, so you guys can join us and have a chat as well. You guys helped us get Them’s Fightin’ Herds funding secured, and we’d really hate to keep you guys in the dark about our progress. We’ll be running this as transparently as possible. Them’s Fightin’ Herds is a project we’ll be undertaking together, you guys and us at Mane6. The progress, the new stuff, the little bumps and their overcoming… We’d like you all to be a part of it! We’ve not decided on a schedule for these streams yet. Streaming too often can be as detrimental to the project as not streaming often enough, as we’d be spending more time in preparing and handling these streams than in the production of the game proper. We’re thinking that biweekly to monthly streams sounds like a good place to start, with allowances for special occasions and large progress showcases on top of that. That biweekly there means once every two weeks, not twice a week, by the way. English is a funny language. Of course, that doesn’t mean we’ll be forgetting about having updates of a different kind. Text-based updates on the site (and our social media) will also continue happening, and backers also get to hear the news a bit early as they develop on the backers forums (setting up soon, as mentioned above). If you backed us on Indiegogo, you’ll be receiving notifications of when these are happening via campaign updates. You can also follow us at our social media places and on this site as well. The sidebar has a little widget to join the Mane6 newsletter if you’d like to keep track of our progress via e-mail. And since we’re already there, here’s the upload for the celebration stream from yesterday. It includes Twitch Plays TFH for the first 2 hours and 24 minutes (! ), followed by Omari drawing some stuff while we answer questions and hanging out with the chat after that. Happening soon! – We’re currently doing a revision pass and getting the artwork set up for the update. It will be followed by Pom’s entry a few days after, then Tianhuo’s in some days more. Goat will not be getting a Book of Lore entry for a while, as she’s still in the early stages of development. Once again, THANK YOU SO MUCH for your support, everyone. We love you.